It’s not quite Thanksgiving, but we got turkey on the brain. Turkey legs, that is! Last week we visited famed restaurant and hot spot Turkey Leg Hut with some fellow Houston bloggers. Everybody goes to this joint for the most delicious stuffed turkey legs. You’ve probably seen some of your faves on Instagram at the Turkey Leg Hut – even Snoop Dogg endorsed them. Yes, they’re that good. Turkey Leg Hut’s new location on 4830 Almeda (in the location where Scrappy Browns used to be) gives patrons way more room to dine (inside or outside). If you know the area, you know parking can be tricky, but there is street parking available (adhere to the signs, though)! You can also get your turkey legs to go – yup there’s an entire to-go counter in the restaurant. Now let’s get into the food and drinks, yall! Both cocktails were delicious. The Purple Reign was sweet and looks classy enough where you can order several and still be considered a lady (lol). 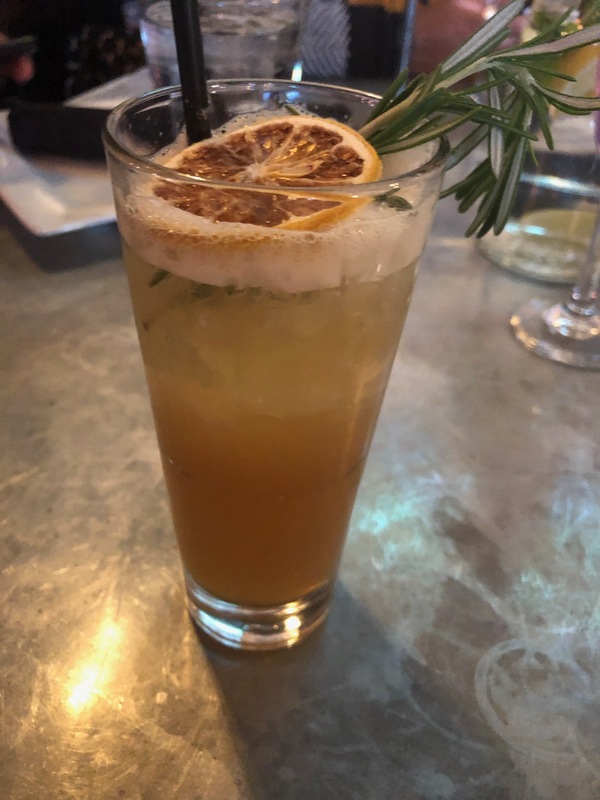 The Sun Tea Swizzle is like the best “tea” you’ll ever have in your life – it’s refreshing, not tart or overly sweet. 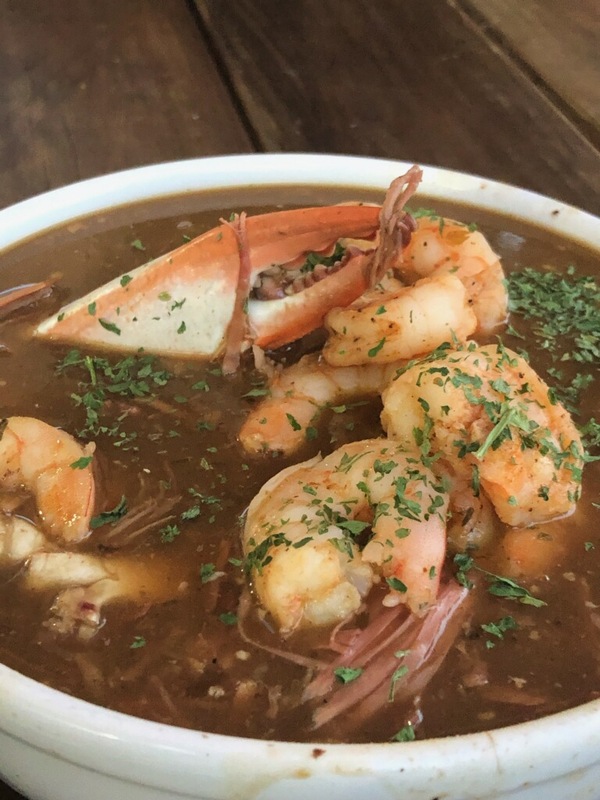 For you gumbo lovers, you can get it at Turkey Leg Hut as well. But note – it’s only available on select days (we believe it’s Thursdays and Fridays). It’s best to check their Instagram first to see! Look at all that shrimp and crab! 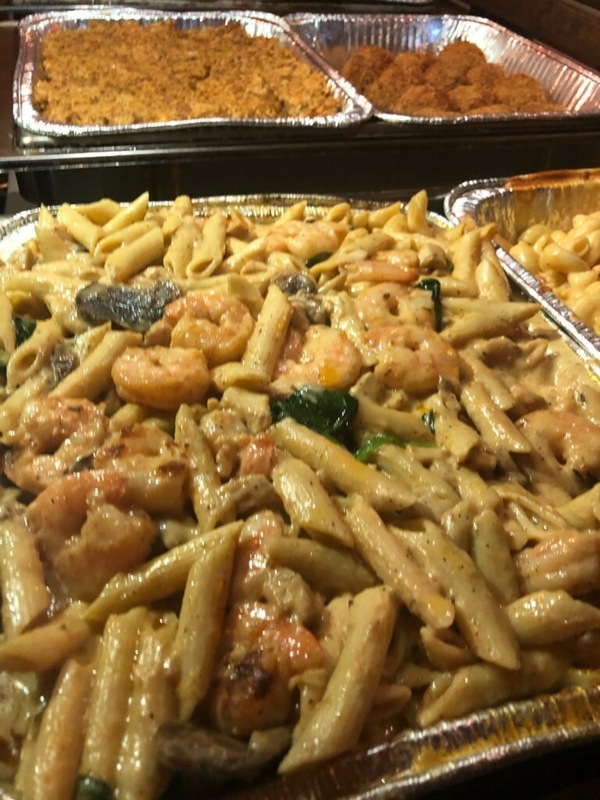 More deliciousness – Pasta Yaya (chicken and shrimp with mushrooms and spinach in a spicy cream sauce); dirty rice and boudin balls! The Alfredo shrimp stuffed turkey leg is a Turkey Leg Hut signature and probably our favorite. 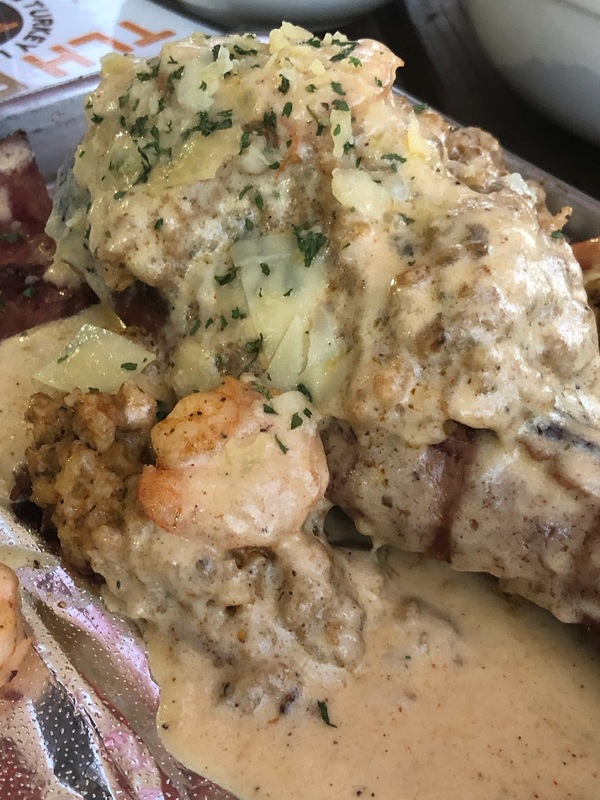 It’s the dirty rice stuffed turkey leg with shrimp alfredo on top. They ain’t playin fair! The other turkey legs are exceptional as well. Honestly, you really can’t go wrong. The Hennessey glaze is like barbecue sauce but so much better and the crawfish mac and cheese is bomb. The turkey legs are so tender that you really don’t need utensils! And stop drooling. We haven’t got to dessert yet! Taking it back to rodeos and fairs, who doesn’t love a good funnel cake? And how about a funnel cake infused with an adult beverage? You’re gonna want to save room for the funnel cakes by That Funnel Cake Place. You can get them at Turkey Leg Hut and they’re huge! They also offer other desserts like deep fried Oreos and milkshakes. 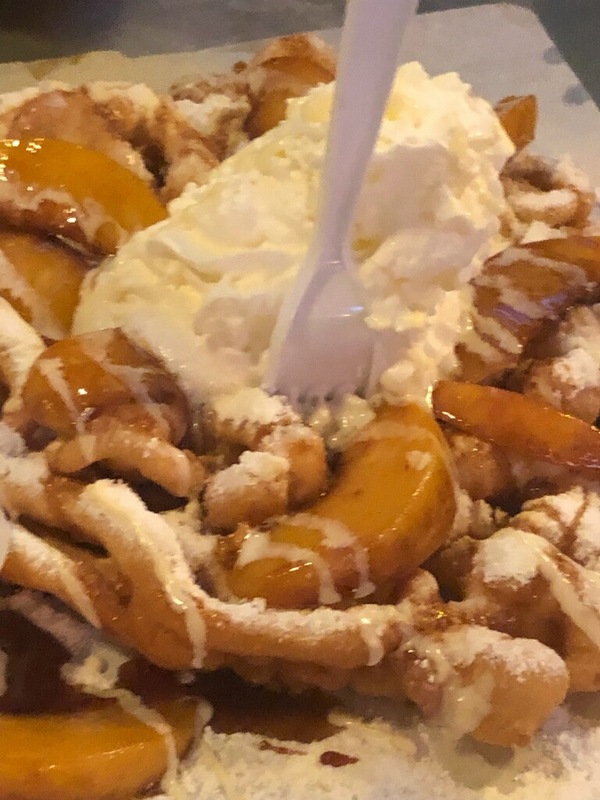 Twisted peach funnel cake (made with Peach Ciroc-infused peaches)! Turkey Leg Hut is open Sunday and Tuesday through Thursday from 11am to 10pm and Friday and Saturday from 11am to 1am. Next post20 Funny Travel Memes You Gotta See!